This is my newly adopted pupperoo. Her name is Holly, coz she looks like a Holstein. Isn't she just the cutest? I really love her! I found this cute little Japanese puppy at Kaleidoscope! These cuties are from greeting cards! This pup and his ball came from Adopt-A-Spotty! These Mutts were adopted from CyberOrphans! These 2 were special gifts from Cindy! 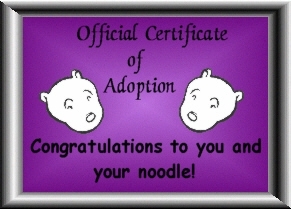 Cindy gave me Poopsie from Furre Baby Adoptions that she took over from Shay'Lin!